Located in South Sulawesi, Indonesia, the Awak Mas Gold Project has a 30-year history with more than 135 kilometres of drilling completed over 1100 holes. It boasts a 1.1 million-ounce Ore Reserve and 2.0 million-ounce Mineral Resource. The project has a large gold mineral resource dating back to the 1980s. Over the years it has seen a number of different owners who have completed a significant amount of technical work and feasibility studies. The project area has seen only limited exploration, and that was 18 years ago, so it holds significant potential. This was evidenced by positive early results from the recent recommencement of exploration including high-grade gold hits in a number of regions. At this stage, all evidence is pointing to Awak Mas being developed into a substantial low-cost gold operation, including two open pit mines. 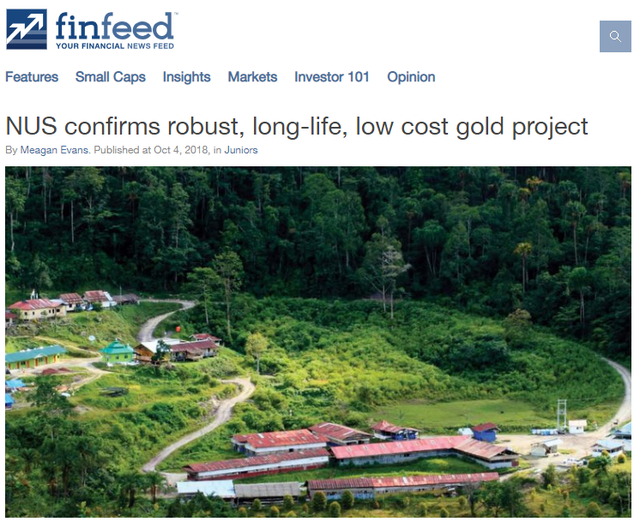 This evidence is supported by the release of a recent Definitive Feasibility Study (DFS) that confirms Awak Mas to be a financially robust, technically feasible, long-life, low cost gold project. The DFS supports an initial 11-year mine life, producing ~100,000oz per year and delivering strong margins. It confirmed a 2.5Mtpa processing rate, low strip ratio of 3.5 and noted the good access to established power and transport infrastructure. It offers significant opportunities to increase project value through optimising the current Mineral Resources and further exploration, which has now commenced. Over this 11-year mine life, there is an anticipated annual gold production of approximately 100,000oz, at a low all-in cost of US$758/oz. This low all-in cost should see the company stand to weather fluctuation in the spot gold price, which is currently sitting at around US$1200; and any significant upside in the gold price will carry over to a jump in project value. There are also significant opportunities to increase project value by optimising the current mineral resources and by undertaking further exploration. Of course, commodity prices do fluctuate, so investors shouldn’t make an investment decision based on spot prices alone and should seek professional financial advice if considering this stock for their portfolio. With all approvals in place for construction, first gold production is targeted for as early as 2021. Drilling program completed with new Mineral Resource of 2.0 Moz at 89% Indicated. New Contract of Work (CoW) agreement with the Indonesian Government that provides secure title to 2050. Surface exploration underway which is already showing positive results. 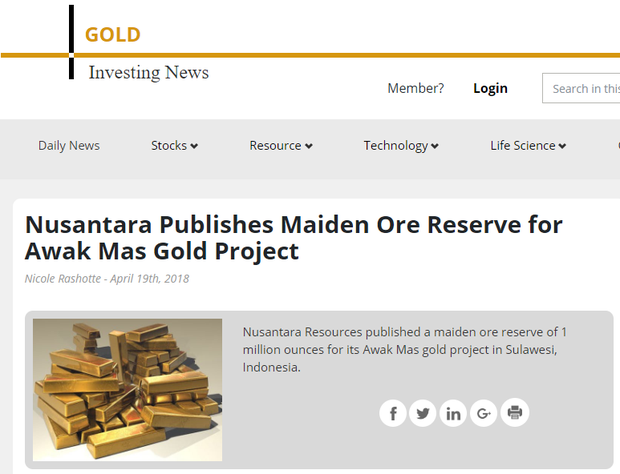 Earlier this year, Nusantara Resources (ASX:NUS) reached a critical milestone, posting a maiden Ore Reserve for its flagship project in Indonesia’s South Sulawesi province — Awak Mas Gold Project — of over one million ounces. Since then, drilling has delivered an updated Mineral Resource of two million contained ounces and an upgraded 1.1 million-ounce Ore Reserve. And now, with a favourable DFS in hand, there’s confirmation of significant potential for further discoveries, with an opportunity to continue to grow the Mineral Resource and Ore Reserve and develop Indonesia’s next gold mine. While not known as a drawcard for Australian investors, Indonesia is one of the world’s most attractive investment destinations, with the National Resource Governance Institute ranking the country 11th out of 81 mining destinations. While it continues to offer exceptional exploration upside, Indonesia already hosts some of the world’s great gold and copper deposits, ranking 7th in global gold production. That said, the country remains somewhat underappreciated as an investment location. Sulawesi, in particular, is attractive to miners with its supportive regulatory environment where NUS receives both local Sulawesi and national government support. It has a long history of mining and provides ready access to an experienced workforce for the construction and operation of the mine. The Awak Mas Gold Project has been the focus of intensive modern-day exploration since the 1988 discovery of the deposit. In that time, it has seen a succession of international exploration and mining companies, including Battle Mountain Gold, Lone Star Exploration, Gascoyne Gold Mines, JCI, Masmindo Mining Corporation, Placer Pacific, Vista Gold and most recently One Asia Resources. The project is supported by quality established infrastructure, including access to low cost grid power, roads, airports, good communication support, and access to ports. The access point from the east coast of South Sulawesi to the project is Belopa, the capital of the Luwu Regency (population of ~350,000), located only 45 kilometres by road from the project. The site operation will be supported by a logistics centre in Belopa on the coast and a support centre in the city of Makassar. Belopa has access to the other provincial centres, including Makassar and Palopo City, via highway, as well as coastal shipping and scheduled air services. Belopa is connected to Sulawesi’s power supply grid and is the proposed connection point for the project’s power supply, via a 150kW transmission line, and communication network. The project is located on non-forestry land and has all required approvals in place for development of the project. NUS wholly- owned subsidiary, PT Masmindo Dwi Area, has sole rights to explore for and exploit any mineral deposits within the project area until 2050, with options for extension after that time. The project is 100% owned through a 7th generation CoW with the Government of Indonesia, which allows 100% foreign ownership. The CoW is highlighted on the map below, as is Palopo, Belopa and the connecting electric power line and access road. 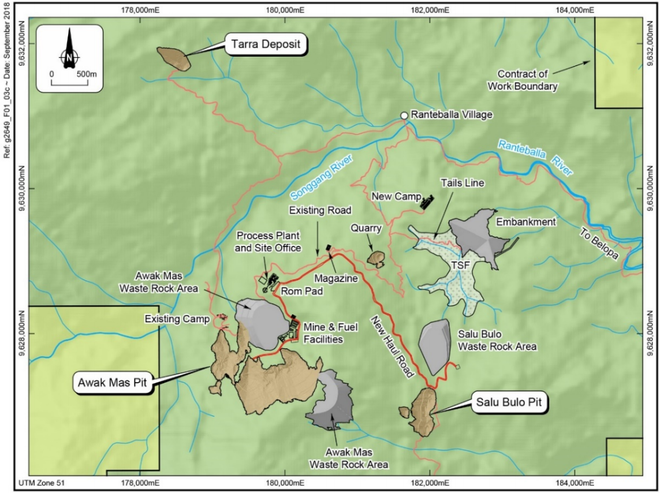 The Awak Mas Gold Project is made up of three deposits – the Awak Mas, Salu Bulo and Tarra deposits. These can be seen mapped out below along with the site layout and nearby infrastructure. On October 4, NUS announced the completion of its Definitive Feasibility Study (DFS). The 2.5Mtpa processing plant will target annual gold production of around 100,000 ounces, using a Whole of Ore Leach flowsheet, delivering project average recoveries of 91%. The DFS identified the potential for an uplift in the gold grade for the Awak Mas and Salu Bulo deposits as further drilling is undertaken to lift the reserve category to Measured status in the initial mining areas. Any grade uplift would have a material impact on project economics. Additionally, known extensions to the Awak Mas and Salu Bulo deposits and inclusion of the Tarra deposit into the mine plan have the potential to extend the mine life. Scenario financial analysis of these near-term opportunities shows a 7% grade uplift and an extra three years of mine life from known mineralisation extensions at Awak Mas and Salu Bulo and inclusion of the Tarra deposit into the mine plan. This could significantly enhance project economics, resulting in a project net present value (NPV) in the vicinity of US$250 million, and an internal rate of return (IRR) of approximately than 25%. However, further Resource drilling and technical studies are required to confirm inclusion of any grade uplift or any mine life extension in the Mine Plan and Ore Reserve. 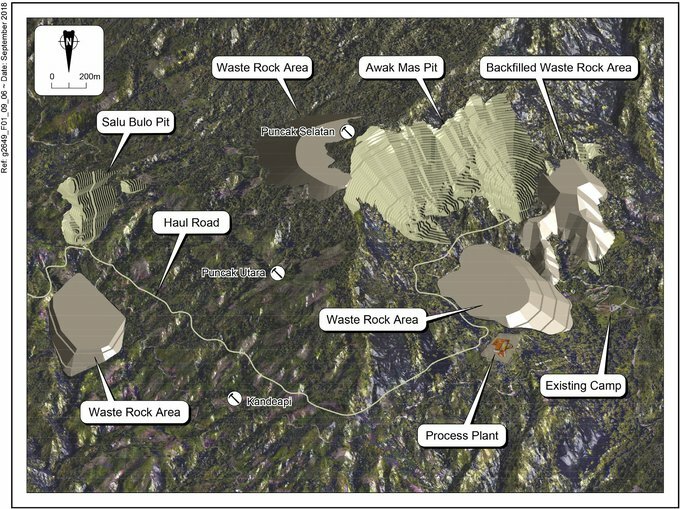 The Awak Mas and Salu Bulo pits, along with the processing plant, existing camp, and waste rock areas are mapped out below. The company also provided shareholders with an exploration update of ongoing exploration at several near-mine prospects. NUS noted that the early exploration results demonstrated the potential of Awak Mas to grow organically and provide potential high-grade satellite operations to augment production from the existing deposits. The recent exploration results combined with extensive historic sampling, confirms the prospectivity of near mine areas and will be the focus of further mechanical trenching by excavator and subsequent drill targeting. A number of untested or largely untested exploration prospects that have the potential to be satellite deposits have been identified, both adjacent to the planned two initial open pits containing a 1.1 Moz. Ore Reserve and near to the proposed processing plant site. Also, there are no sell down requirements for the first ten years of the project life once production has commenced. This is unlike many other low-cost jurisdictions, such as those in Africa, that often require divestment. That means with production scheduled to get underway in 2021, there’s no divestment requirement through to 2030. This neatly aligns with the project’s 11-year mine life. Over this mine life, NUS anticipate annual gold production of approximately 100,000oz, at a low all-in cost of US$758/oz. — significantly below the current spot gold price of around US$1200. In the tenth year after commercial production, NUS subsidiary, Masmindo, is required to offer at least 51% of its share capital to willing Indonesian participants at fair market value in accordance with international practice. To put this in context, in mid-September, NUS announced an upgrade to the Ore Reserve of 1.1 million ounces contained gold within a 2.0 million-ounce Mineral Resource. 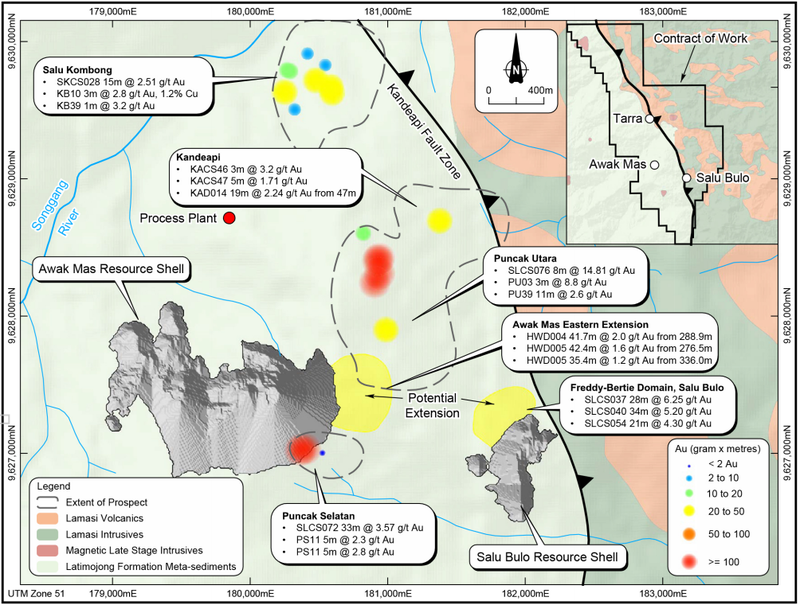 The Awak Mas Gold Project Probable Reserve, at 0.5 g/t gold cut-off using a US$1250/oz. gold price, is 26.9Mt at 1.32 g/t gold for 1.14M contained ounces. The upgraded Ore Reserve represents an 11% increase in contained gold from the previous Ore Reserve and incorporates all drilling and mine planning completed as part of the DFS. NUS expects to continue to grow the Awak Mas Gold Project Reserves and Resources to a globally significant quality and scale, with significant exploration potential still to be tested. With the DFS in hand, NUS can push forward with Awak Mas — one of just a few undeveloped gold projects within the Asia-Pacific with all approvals in place for development. NUS is targeting low-cost open pit mining and processing. Its development strategy is for construction of a modern, low strip ratio open pit operation with ore processed by standard carbon-in-leach (CIL) processing, delivering high gold recoveries. Environmental approval has already been received for the project which, as mentioned, is favourably located in non-forestry land close to established roads, ports, airports, and grid power. NUS’s second strategy is to grow the resource base and support a mining operation beyond the initial project life of 11 years. Multiple drill-ready targets have already been outlined extending from the three main deposits and in other areas of the 140 square kilometre CoW. 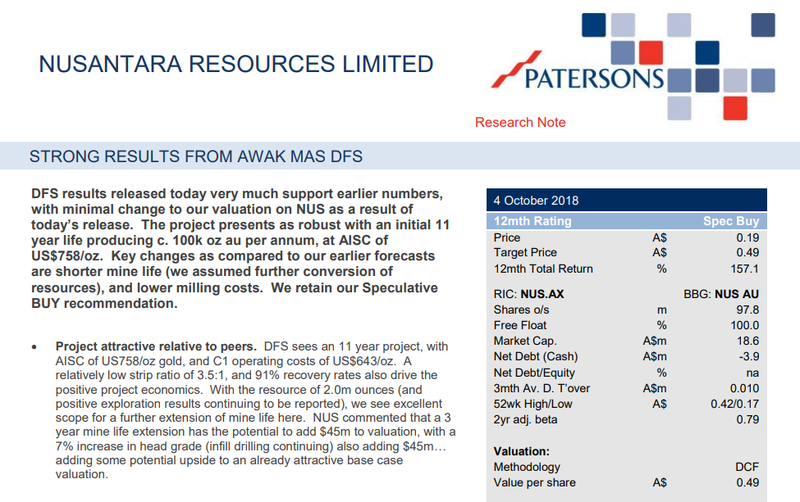 Completion of the Awak Mas DFS marks a significant milestone for NUS and may indicate that the company is undervalued compared to its ASX gold peers. Work is now progressing on securing financing for project development and continuing CoW exploration. In fact, NUS is in discussions with strategic partners to help create long-term value with financing already underway. Backed by the DFS findings, the project now has the potential to be developed into Indonesia’s next gold mine, providing benefits to shareholders, the community and other stakeholders. While the market seems to have been slow to recognise the potential upside in NUS, Awak Mas, and in mining in Indonesia, a number of analysts are taking notice. Following the release of the DFS and the exploration update, Patersons Securities released a research note on October 4 tagging NUS with a ‘speculative buy’ recommendation. The broker’s analyst, Cathy Moises, noted that the project was attractive relative to its peers and had ‘excellent scope for a further extension of mine life’. 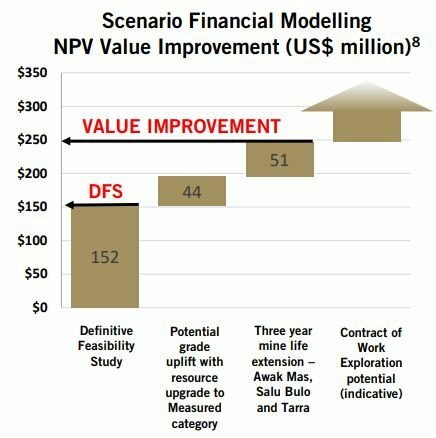 Moises highlighted that ‘a three-year mine life extension has the potential to add $45m to valuation, with a 7% increase in head grade (infill drilling continuing) also adding $45m... adding some potential upside to an already attractive base case valuation’. Using a discounted cash flow (DCF) methodology, the broker valued NUS at $0.49 per share — a favourable comparison with the company’s market cap at the time of release of just $0.20. This was the third research note out of Patersons this year, the first coming in May. And the second in August. Paterson’s identified another sign of confidence on NUS’s share register: it boasting a number of significant shareholders including Lion Selection Group, Australian Super, and Macquarie. Prior to this, in May, Peter Strachan of Strachan Corporate, released his own research note on NUS. The report made note of the low cash costs of the operation thanks to the low-cost grid power and skills, the favourable CoW, and supportive drilling results that support a mine life of over 10 years at 100 Koz/pa. It surmised that the “Financial metrics reveal a low-cost, undervalued development with a value range of 68-85 cents per share” (as at March 16, 2018). Note that these were published before NUS released today’s optimistic DFS. And while still an early stage ASX junior, there were even more unknowns at that time before the DFS was completed and its findings made available. It should be noted here though that broker projections and price targets are only estimates and may not be met. Those considering this stock should seek independent financial advice. NUS has now verified the Awak Mas Gold Project to be technically feasible, financially robust, and offering significant opportunities to increase project value via further exploration and optimising the current mineral resources. The next step is securing a strategic partner and then financing for the development of the project. With first gold production targeted for as soon as 2021, now could be the time to take a look at this promising gold junior.